Herbsmith offers a number of traditional Chinese herbal blends to holistic veterinarians. These ancient formulas have been used successfully for thousands of years in the Orient and remain popular formulas for use in veterinary clinics throughout the world today. Traditional formulas are available in powders, tablets, 5-to-1 extract tablets, capsules, and tea pills for ease of administration. 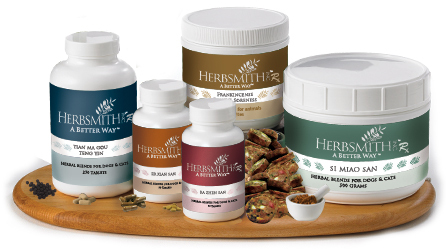 Consultations Available – Herbsmith offers free veterinary consultation with Dr. Chris Bessent, holistic veterinarian and founder of Herbsmith, regarding any of the single herbs. If you are a veterinarian and would like to set up a consultation, call 800.624.6429.